If you live in Miami, you better have property insurance that comprehensively covers the wide variety of possibilities for damage caused by living in a wet, tropical climate. That’s because water damage is one of the most common types of property damage that owners deal with nationally. And the issue is intensified here in South Florida, particularly during the rainy season from May to October. From severe storms to hurricanes, bursting pipes to leaking appliances to roof damage and leaks – it is clear that water damage is a reality that many citizens of the greater Miami area face. And, with such a massive potential for finding yourself in the unfortunate position of having to deal with the burdensome and potentially hazardous consequences of water damage, it should be easy to see why water damage is a serious problem that should not be ignored. – Structural damage to your home or business. – Damage to your floors, walls and personal items. – Mold damage in your property. Filing a water damage insurance claim isn’t as simple as just calling your insurance company and telling them what happened. The claims process can be daunting, if not manifestly difficult. Additionally, insurance companies will often try to pay as little as possible or deny your claim altogether stemming from the fact that the ultimate goal of the insurance industry is for companies to maximize their profits, as opposed to providing coverage and indemnification for customers in potentially dire situations. Just remember that with the insurance industry, you are dealing with for-profit corporations. Their true vested interest is in paying out the least amount of money possible. With all of this in mind, we put your insurance dollars to work by cooperating with your insurance company to file your water damage insurance claim properly, ensuring that you get what you deserve. 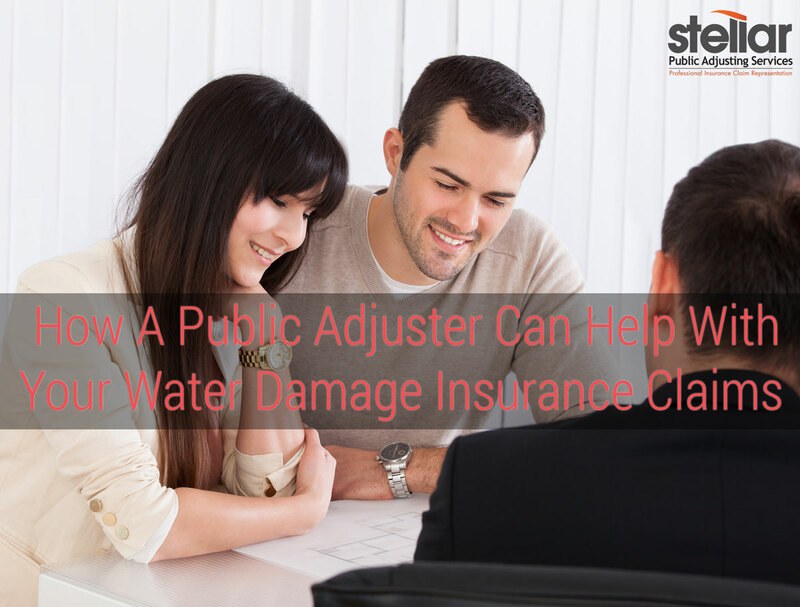 If you currently have a leaking roof, a dishwasher leak, a broken pipe, an AC leak, a shower leak, or you have sustained damage from a hurricane or severe tropical rainstorm, and you need to file a water damage insurance claim, call Stellar Public Adjusting Services immediately. We have a direct line to water remediation companies that can get the water out of your property quickly and we will look at the detailed and complete damage of the water both inside and outside of your home or business. Call Stellar Public Adjusting Services Today! Water damage is as prevalent in South Florida as palm trees and coconuts. We have seen many cases of water damage and our experience enables us to spot all possible damage, both current and long-term, to make sure you receive the maximum amount of compensation. Call Stellar Adjusting on (305) 396-9110 for a free policy analysis and property inspection. Hire us for water damage insurance claims help in Miami. We will make sure you get what you deserve from your insurance claim for your property damage.